I dunno. When I was a kid, maybe five years old, my parents gave me an illustrated children’s book of Greek mythology. 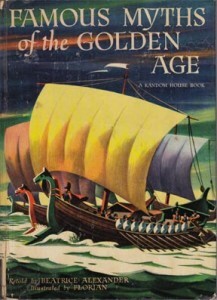 Famous Myths of the Golden Age – 1958. And it was all there – Apollo in his golden chariot, Prometheus chained to a rock, Icarus falling into the sea, Jason, Medusa, the Golden Fleece, even tales of the brave Odysseus. And I ate it up with a spoon. I loved every page. But today, how many people do you think really have had any direct exposure to the history, ideas, art, and culture of Ancient Greece, except maybe having once attended a toga party at a Greek fraternity in college? no comments	| tags: Famous Myths of the Golden Age, Goldfinger, Idioms, It’s All Greek to Me, James Bond, Opening Pandora’s Box, Shazam!, Shirley Bassey, The Midas Touch	| posted in More Idioms!